I’ve always loved watching Bill Snyder’s teams. I’ve particularly enjoyed the second Snyder-era for which I’ve been a Big 12 blogger and active observer of the league. His teams this decade have always been designed to try and game college football with calculated strategies and recently I’ve learned more about his original run at K-State and some of the strategies he employed to build the program. Such as designing the Powercat logo and uniforms to mimic “America’s team” the Dallas Cowboys, introducing college football to the athletic treasures of JUCO recruiting, and also his breakthrough innovations with the spread in the early 90s and then the QB run game in the late 90s. You have quite a few different and innovative defensive minds and trends flowing from Manhattan on that chart. Offensively the list is less impressive, indicating Snyder has tended to maintain more control on that side of the ball. The second-Snyder era teams were a bit different. The JUCO mines are now tapped harder by lots of programs and coming to Manhattan to play for a disciplinarian head coach who makes guys run the stadium stairs and call their momma for cussing has been a harder sell. Instead, second-era Snyder-ball has been defined by infusing the roster with preferred walk-ons from Jayhawk community colleges, still signing JUCOs and transfers but not as many great ones as perhaps needed, and hitting the 2/3 star players of America’s heartland that other programs overlooked. Such as the highly underrated Jesse Ertz from small-town Iowa. These teams have tended to be defined less by having some great talents and more by being a highly disciplined team of overachievers that force offenses to work their way down the field without committing errors on defense and utilize a QB-run game based offensive approach that generates numbers and angles for their runs and passes. It’s sort of interesting to observe that things haven’t really slipped that far in terms of results over the last few years. 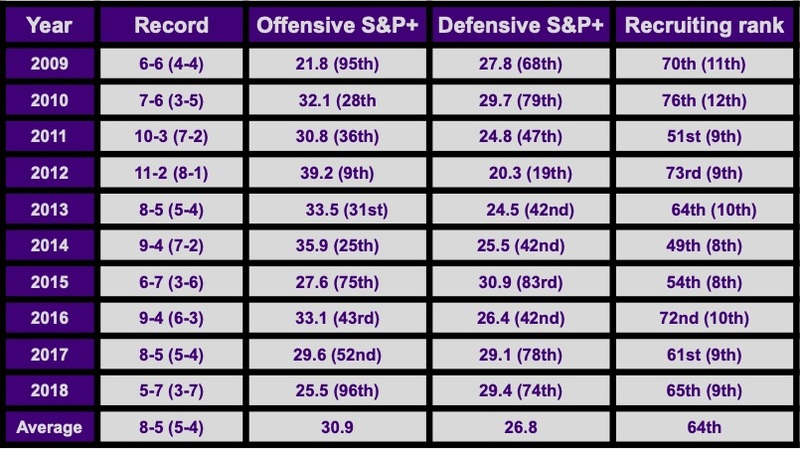 They’ve had two losing seasons in four, which is below what a legend like Snyder expects, but the first one was mostly due to losing Jesse Ertz at the beginning of the season as well as several defensive starters over the course of the year. It wasn’t until this 2018 team that we really saw the Wildcats slip in uncharacteristic ways. Here’s my take on what went wrong at the end. Did archaic recruiting strategies doom Snyder? This is the dominant narrative, in large part because recruiting services dominate the college football media market these days and naturally that’d be the narrative they’d sell. There’s no doubt that Bill Snyder’s remarkably out of date recruiting tactics set a ceiling for K-State that is lower than it could be. However, it’s hard to point to recruiting for the reason for the decline unless we refuse to take the service rankings particularly seriously. Personally I’m okay with that, I don’t think the rankings tend to differentiate all that terribly well between the thousands of 2/3 star kids across the country, nor do I think the difference between all of those players and the various 3/4 and even 5-star players is always as great as it’s made out to be. I don’t think there’s much doubt that the teams Snyder fielded over the last four years were less talented than say, the 2012 team that split the Big 12 championship with Oklahoma (and beat OU on the road). But you don’t really see that reflected in the recruiting rankings but by their performance on the field. What’s more, I identified earlier this year that where K-State is lacking this year in contrast to previous seasons isn’t with the skill talent so much as the infrastructure pieces. Alex Barnes is a good feature back, Dalton Schoen and Isaiah Zuber aren’t miles behind what K-State has relied on at WR in other seasons. Where they are noticeably worse is in their blocking at FB and TE and their QB personnel. Alex Delton is a great athlete but he can’t throw worth a lick and even Snyder’s system can’t rescue a QB that can’t reliably hit anything in the passing game. Meanwhile Skylar Thompson has some attributes as a spread QB that can move around but he was not terribly good in the QB run game that generates all of the important advantages for the Wildcat OL and skill personnel. K-State’s recruiting hurt them more by failing to find fits on offense than in failing to produce the kinds of athletes they need. The S&P+ offensive rankings make it clear that this offense struggled to overcome their talent disadvantages without a Snyder-ball QB. Kenny Robinson of West Virginia: 1.5 TFL, three INT, four break-ups, 1 forced fumble. Caden Sterns of Texas: three TFL, four INT, four break-ups, zero forced fumbles. Greg Eisworth of Iowa State: four TFL, one INT, three break-ups, two forced fumbles. Did archaic schemes doom the Wildcats? If you watch Texas HS football these days you’ll see a lot of Snyder-ball style offense. Texas’ QB recruit Roschon Johnson runs a very Snyder-esque offense down in the Golden Triangle and it looks much like you’d expect a good Snyder team to look. They fling it around to solid but unexceptional WRs who are working in isolation out wide and it all works off their ability to run QB power and get an extra blocker at the point of attack. You see this some at the college level as well but there’s less of it because teams don’t necessarily want to risk running their QB 15x a game. When K-State had a QB that could do that and still hold up well enough to hit some passes on out-leveraged secondaries it worked really well. It’s unquestionably a viable strategy though and the increase of RPO tactics and read plays have made QB run game even more devastating and multiple than in the past. Ohio State has leaned on that strategy this decade, up until this season when they went more full-bore into spread passing as the main thrust of their offense. Even while utilizing that to great effect they’ve struggled with situational offense where they needed to run the ball, breaking through only against Maryland and Michigan when Dwayne Haskins finally started to run the ball (15 carries against the Terrapins, seven against Michigan). On defense K-State leans on the 4-2-5 Over quarters defense that is considered one of the best practices around the country. They were out early on this, running a version of it taken from the famous Miami defenses of the 80s and 90s late in Snyder’s first run and now they run a version that’s about as current as anything you see elsewhere. New DC Blake Seiler has tried to tweak and update it to shore up the main weakness, which was that teams usually knew what they were getting and QBs could be trained up on where to attack them. Obviously the performance of their safeties this season suggests they’ve still been pretty vulnerable. Their issues on defense have largely related to lack of talent and a lack of return on some of their tactics. You give something up when you play four defenders with their hands down against today’s offense, in terms of disguise, angles, and versatility in coverage. You’d better be getting a lot from your front four to make up for what you’re giving up and K-State simply hasn’t had the war horses to really justify a refusal to play another LB or DB. They could use some updates here but simply having better talent would also do the trick. 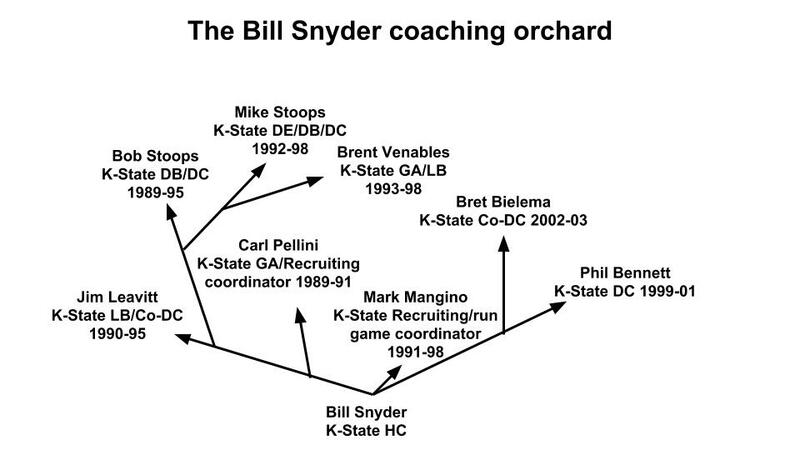 I think there’s been some real incongruity amongst the coaching staff at K-State this season. When Dana Dimel left for UTEP he not only took the Wildcats’ best fullback but he left Andre Coleman at the helm of the offense. Andre Coleman was a former WR from the early 90s and a time when Bill Snyder was drawing an edge against his competition by embracing spread sets and the passing game. In Coleman’s senior year he and Kevin Lockett were the main engines of the offense, producing 761 and 770 receiving yards respectively. Quarterback Chad May ran for negative yardage that season and their offense looked more similar to this season’s unit than the QB run Snyder-ball units most of us are accustomed to watching. That was great back then but there’s not much advantage to be gained in the Big 12 these days by being that kind of team. Everyone is doing that and you need something to stand apart. There’s definitely some indicators from Manhattan that Coleman wanted to get back to the K-State offense he came up in rather than the bruising style that Collin “Optimus” Klein utilized in the early decade and even some indicators that QB coach Klein agreed with that take. Perhaps because Klein knew that Skylar Thompson was both their best QB talent and not up for that same kind of style. But Snyder didn’t want to embrace that style and it took a while for K-State to really start clicking on offense this year and get anything going with the identity they needed to accept. There’s also the fact that K-State hasn’t really maximized their roster for this season. They don’t have the rotations of squatty, immovable DL that we’re accustomed to seeing and the better running teams on their schedule ran wild on their defense. They didn’t have the “sixth OL” TE to extend the width of the front and give smaller, anti-spread defenses something to worry about and the same guy asked to play that role was also asked to be their lead insert fullback at 6-7, 250 (Blaise Gammon). Robbed of angles generated by the QB run game and hard-hitting ancillaries, the K-State run game simply didn’t have much in the tank until late in the year when they finally worked out how to feature Barnes with spread run game angles that don’t rely on the QB to be a power back. Once they worked that out, surprise! It turned out that Snyder’s offensive acumen was plenty wide-ranging enough to work out how to make it work. Utilizing a more smashmouth spread approach with the QB threatening the perimeter with pulls or quick tosses while the OL moved bodies around to create numbers at the point of attack actually gave the Wildcats something to hang their hats on. The center/backside guard pin and pull from 2×2 was a pretty effective scheme for K-State down the stretch and it only asked Thompson to handle the perimeter with a pull threat or quick game toss. But the Wildcats needed a long time to really settle on their strongest identity and consequently struggled to make the most of their roster. A team like this can’t afford to wander through the season, the Snyder plan has always counted on sorting through issues in fall camp and then against a creampuff non-conference slate before having a much more precise, disciplined, physical, and conditioned team than the rest of the league for conference play. Of course the issue was that their strongest identity wasn’t Snyder-ball. Bill Snyder made something of nothing from the K-State program and then came back after retiring to give them seven more winning seasons and another Big 12 championship. In the end it seemed he didn’t quite have the juice to keep things going at a high level. His coordinators left and it took a while to get younger across the staff by promoting Klein, Seiler, and Coleman. Then there was also all the whisperings behind the scenes that Snyder was delegating a lot to his son Sean Snyder and hoping to set him up to succeed him, which wasn’t yielding the kinds of results to make that a viable succession plan to the athletic department. In the end Snyder determined to step aside, hopefully to support his AD-chosen successor, and we’ll see what happens next. But the era of Snyder-ball is clearly over and it will be missed.